1841 (Oct. 1) Derry, Ireland to Washington, D.C., datelined folded letter endorsed "On Public Service" and addressed to Genl. R. Jones, Adjt. Genl. 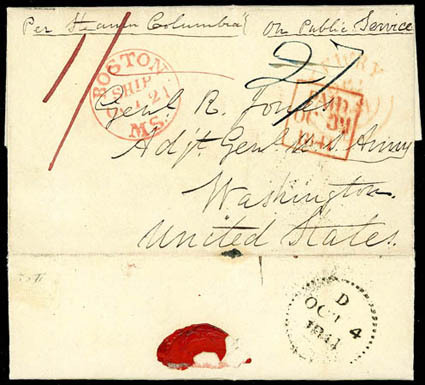 U.S. Army, with faint red "Derry, OC 1, 1841" cds, red Dublin boxed "Paid, OC 3, 1841" datestamp and red ms. "1/-" packet rate prepayment, black dotted circle Liverpool "D, Oct 4, 1841" cds, carried by Cunard Columbia from Liverpool Oct. 5th to Boston arriving Oct. 21st, red "Boston Ms. Ship Oct 21" cds and blue "27" cents due rating for 25¢ inland postage plus 2¢ ship fee, crossed out as letter and sent free to a government official, Very Fine, An Exceptional Example of a Rare Liverpool Datestamp. The dotted-circle Liverpool datestamp was used only in 1841 on outgoing packet letters carried by Cunard. A link back to Sale 75 - Lot 194, along with its description, will be appended to your message.